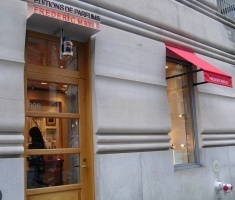 Stepping into the Frédéric Malle Editions de Parfums boutique, you might think that you’ve mistakenly opened the door to a Madison Avenue living room or an upscale art gallery, rather than a retail venue. The carpeted space is punctuated by a French Art Deco desk and armchairs, wood carvings from Africa, a drawing by Picasso, contemporary landscape paintings, and a framed photograph of the writer Charles Baudelaire. Sage-green velvet drapes soften the corners of the room, and folding wooden panels screen off the view and the noise of the street beyond the windows. After a moment, however, you’ll notice all the signature elements of the Editions de Parfums style. Instead of bookcases filled with first editions, there are shelves of richly scented products arranged by “title.” The wall above the fireplace is hung with photographs of the fragrances’ perfumers, and a sleek, refrigerated cabinet stores and displays the eighteen fragrances in the Editions de Parfums collection. A bright red sofa, upholstered to match the Editions de Parfums packaging, faces a row of three “smelling columns." Each of these towering glass columns (which resemble time-travel capsules) can be infused with a spritz of fragrance; a window-like opening then allows the customer to inhale and experience the fragrance in the pure air of the column's contained environment, rather than on a mere strip of paper. 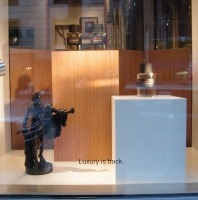 This boutique is also the only American location to carry the new Frédéric Malle home fragrance line, including nine candles and an innovative “rubber incense” product. The latter is a set of scent-permeated plastic mats, meant to fragrance a drawer or a closet. In keeping with the overall Malle aesthetic, this clever item — packaged like a limited-edition art book — merges tradition and technology, in a form of literate luxury that suits the shop's exclusive neighborhood. Details: 898 Madison Avenue (at 72nd St.), New York, NY 10021, 212- 249-7941, website. — Images and report submitted by Jessica M.